I often prefer to use a wide angle lens for these types of shots... it's more dramatic. 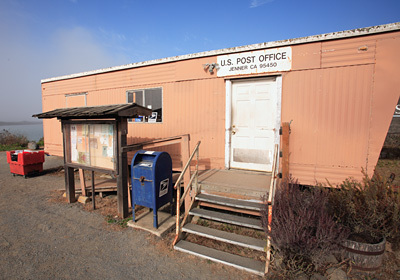 This little Post Office in Jenner, CA (up the Northern California coast) had terrific morning light and a pleasing color palette. I took the first shot standing back at a distance with the zoom set to 40mm. But the image just didn't have the impact that I wanted. So I changed the focal length to 17mm and got as close as possible for this composition. Here's the resulting image. Your posts are very helpful for novice photographers like me. This shot of the Jenner PO is a perfect example. This tip is practical and can be used in almost any "shooting" circumstance. I look forward to taking a "daily" look at your blog. Sorry, Derrick - Safari was acting up on me and "multiplied" my comments. Please erase the extras if you can.